This is a tasty adventure in stew. I took an over-the-fire dutch oven recipe with serving portions per "scout" and made it work for us normal people. Heat pot or Dutch oven. Add bacon and cook until done. Leave the bacon in the pan. This is now the oil needed to brown the beef and keep everything from sticking (Alternately use a few Table Spoon's of any cooking oil). Add beef and cook until brown on all sides. Add about a 1/4 of the potatoes and briefly brown. (Why are we only cooking a 1/4 of the potatoes now you ask? The potatoes contain starches that will help naturally thicken the sauce). 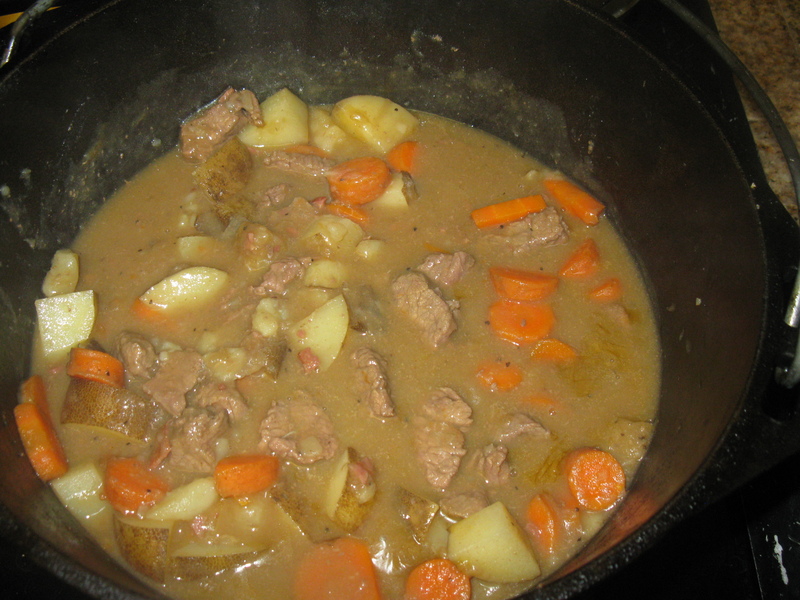 Add packet of onion soup mix or beef stew mix and just enough water to cover ingredients. Cover and boil (simmer if possible) for 30 minutes. Check flavor and season as required. Add remaining ingredients and a cup of water. Remove cover and check consistency. If it is watery leave cover off and boil for another 15 minutes or add a little flour or Bisquick to thicken the sauce. If you don't have any flour throw a slice of bread in and stir.